The day before the South Downs Way 50, some random radio station was on in the kitchen and The Gambler by Kenny Rogers came on. I remember my mum playing it when I was younger and I’ve always liked it but more for the jangliness than the sentiment. Listening to it a few days ago though, it really struck a chord and I noted it down, thinking the lyrics might be good for my post race blog, whatever the outcome. I couldn’t have been more right! The South Downs Way 50 is a Centurion Running event covering almost 50 miles from Worthing to Eastbourne. It rolls up and down along vast, open green fields, chalky paths and panoramas that go on for miles. You do, of course, have to be looking up to make the most of them, but we’ll come to that later. 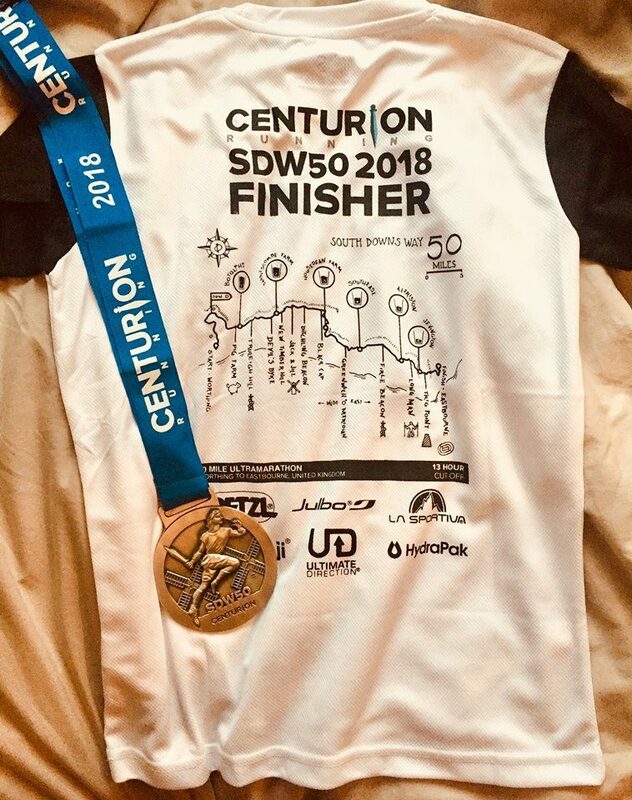 The Centurion team are total pros and runners are well looked after, well fed and watered and treated to a hefty medal upon completion. It’s no wonder that these events sell out so quickly and the community is like one big family. For me, the race was about gauging where I was going into my first 24 hour event in June. I chose it because it was so well thought of, and James Elson, the RD, was genuinely happy to see me come down to try and compete in a strong women’s field. Being navigationally challenged and never having been to that part of the world before, I managed a three day recce of the course with the awesome Scott Ulatowski on the way back from France at the end of January. 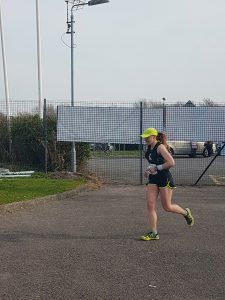 I’m really glad I did because, although I think it would have been really difficult to go wrong – the course is well marked and obvious – I would have been oblivious to just how hilly it actually is. I assumed that ‘darn sarf’ everything would be super flat. Erm, no. But again, we’ll come to that later. For a few weeks before the race, partly due to work stuff, I had been feeling really tired. My training was okay but probably not where it should have been if I’m totally honest. My pacing was pretty good, but I just hadn’t been feeling it. Everything was a bit blah. Rightly or wrongly though, I felt fairly confident that I could put on a good race. I knew the competition was fierce, but I was sure that, with a good day, I could hold my own and come away with a 7 hour something result. I still feel I could do that, but yesterday, it just wasn’t my day. There aren’t any good excuses really, but the build up certainly wasn’t ideal. We had travelled down to Worthing on the Friday in our van: not Edna the motorhome, but a smaller camper, as she was out of order and a bit slow for such a long drive. About 7 and a half hours later, we arrived at our Air BnB a few miles from the race start. Never having used this system before, we didn’t know what to expect but we certainly didn’t expect to be woken up at 11.45 being told we would have to leave. Needless to say, we didn’t get a great sleep after that had been resolved and then crept out at around 6.30 the next morning to avoid any more nastiness. I had registered the night before, so took a bit of time to eat my breakfast in the van as the rain came down, then found a smokers’ shelter to do some yoga in before lining up for the start. Mr Elson doing his thing. 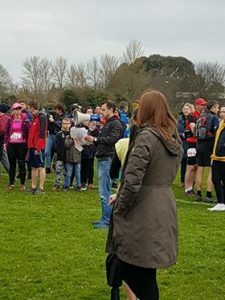 The race sets off from a recreation centre playing field and follows footpaths for about 6 miles before coming onto the South Downs Way at Chanctonbury Ring. Eddie had told me to get to the front so as to avoid any congestion on the footpath, so I ducked into the front 20 or 30 people and had a glance around. Tom Evans was off to the side, looking very focused and strong. What an amazing runner this guy is; it’s fantastic to have someone from this country competing the way he is. The ladies favourite Sarah Morwood was just a little bit behind me too. I am a bit in awe of her doing what she did yesterday after what sounds like an horrendous accident not long ago. Plus, her calves are incredible! James’ briefing taken in, the countdown commenced and off we went. It didn’t feel like a fast start and I could see Tom up ahead for about a minute, before we all started to settle into it. Sarah came past me with her headphones in and I told her to have a good run, which she blimmin’ did! From the outset, I didn’t feel right though. I was finding it hard to get enough air in, something I have been finding lately. It’s like I can’t get oxygen into my lungs and it’s just sitting at the top. When I first started running, I would often get a stitch like pain around my left collarbone, and this happened again yesterday. I tried my best to keep pace though and chatted briefly with some of the other ladies, Charley and Annabelle. 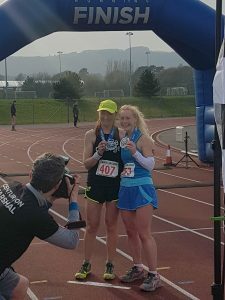 They had both done the race before, Annabelle four years ago and Charley last year, winning the Grand Slam of four 50 mile events. I told them it felt a bit fast for me, which they both agreed with but I had to eventually slow to a walk and they went on ahead. Feeling very sorry for myself and more than a bit grumpy that I was having to walk, I did get a bit negative here. It was right at the start and already I was feeling like this?! I ate a few dates and a Chia Charge bar as I chugged along towards the first checkpoint at 11ish miles. Jayson was meeting me at the first point where crews were allowed, Devil’s Dyke, about 15.5 miles in, so I had decided to keep going through the official checkpoint. Charley and I were consistently catching and passing one another from somewhere around here, so it was good to have someone close by. By the time I reached Jayson, I was done in. My breathing was so bad that I had no energy at all, and my left hip – an injury from earlier this year – was shouting at me. Surely I wouldn’t be able to do another 30 odd miles feeling like this? Jayson gave me some sweets, filled bottles and reassured me, telling me that maybe I just needed to reassess and adjust my aims (in so many words!) I knew this deep down and knew that if I stopped, I would gain absolutely nothing and lose so much more. So I sucked it up and got on. The original plan was for him to see me at mile 36 and for me to use the official checkpoint at mile 26 to refill bottles, as the next crew meeting point was only 6 miles further. He said he would see me there anyway and I got moving, shovelling some Haribo in. Although I was still grumpy, I resolved to just get it done. This would become a different gauge, not of fitness but of resolve and slogging it out. There will come a point, probably more than once, in the 24 hour race where I need to just grind some miles out, so this was going to be preparation for that. It was windy up on the tops and so, head down, I kept moving. I still cared about time but knew it wasn’t going to be my day and that I wouldn’t be happy with the numbers, so I tried to stop thinking about them. I went through Saddlescombe Farm without stopping where I met Charley again. We ran together for a while, chatting about how our days had become very different to what we had planned but both determined to finish. This section is a bit fuzzy already but Jayson and Scott were waiting at Ditchling Beacon so I stopped briefly again to grab some Hula Hoops and tell Jayson that I was going to finish and my hip had eased off, but it was going to be a grind. Mandy Regenass passed me here – Scott’s runner and friend – and we ran off and on a bit together. She was really strong and perky and had obviously paced it much better than me! She mentioned something about the Air BnB though, and I had a huge rant at her. The first time we met and I was such a grump! She ran away from me after that and I had to apologise later for potentially bumming her out. I realised then that I could blame all sorts of things but ultimately, I was in charge of what I did from then on, so I could keep being miserable and suffer even more, or I could start taking things in and thinking about the positives. The second choice seemed more appealing! The halfway-ish point is Housedean Farm, about 26 miles in. I think it was coming up to this point that I ran a bit with Gavin Bussey. I had never met Gav before but knew his partner/friend/crew (I’m embarrassed that I don’t know this!) Lorna McMillan from being generally awesome and running with her in a few races. Gav was great: he ran with Charley and I on and off and seemed to just glide up the hills when I was reduced to a walk. Several times he told me to keep running when my legs were flat and I started to plod which I don’t know if I’m grateful for or not. I found myself on my own descending into Housedean which had become a common pattern: the descents on this route are great as they’re not technical and they go on for quite a while, so I tended to be able to pick up the pace a little. This was where I had my first cup of cola and a sandwich, along with a good handful of fruit. Every checkpoints food selection was amazing. I walked out of this one with pineapple, melon and orange which was perfect for me at that point. A guy fell in step with me here and hadn’t realised there was a checkpoint with food but I told him there was no way I was sharing my fruit! He didn’t go back and we chatted for a few minutes about how this was his first ultra as he was turning 50. He was going well, but I started a run again and left him to have a walk. Somewhere along this section, I found myself with Charley and Gav again and we chewed the fat over various races we’d done or wanted to do. Gav is heading to Chamonix this summer to do the PTL, an epic Alpine adventure over several days that you run with a partner. Having being to UTMB week a couple of times and seeing these guys finish, it is always inspiring as you can clearly see what an experience they’ve had. I’m sure Gav will nail it with the mindset he displayed this weekend. Running into Southease at around 33 miles, you have to cross a railway footbridge and, as I was now looking up at stuff, I noticed we had an unusual audience. There was a herd of cows poking their heads through the fence next to the crossing, clearly bemused by the amount of brightly coloured people passing their field. It genuinely looked like they were fascinated! I think I grabbed some fruit here as we started the ascent to Firle Beacon at 36 miles where I would see Jayson one last time before the end. Again, it’s a bit fuzzy, but when I got there, he gave me my new bottles, some encouragement and told me he would see me on the track. Almost on the track with the Face of Pain. It was around this point when I started to get into more of a rhythm. I knew how close I was to finishing and started being able to shuffle uphill without walking too much. It was also around here that I met the most happy ultra runner I have ever encountered. I’m going to call him Smiley Jason. He was so overjoyed to be running, to be doing the race, to be in the outdoors and to be meeting people, that he was really refreshing. We pootled along together towards Alfiriston until I pulled away from him on the descent into the village. Alfriston is a very pretty place with a fab shop selling huge slabs of cake, as we discovered on our recce. No time for that now though, and I made my way into the village hall for some coke and a loo stop. Charley and Gav where there when I came out, having a feed, so I said hi and made my way back out. I wouldn’t see them again until the finish. Chugging my way up the penultimate hill, I actually started to appreciate the view a little more. Looking down into a hazy bowl, not for the first time on a race, I thought about how lucky I was to be able to do this. Results matter to me as does race performance, but what’s more important is the fact that I am able to get my body to do crazy things and see some beautiful places, surrounded by like-minded people. As if on cue, Smiley Jason caught me again and we chatted more about some of the events we’d done. I’m not sure where he pulled away from me, but I did see him again at the end, still smiling! Heading back down towards the final checkpoint in Jevington was one of my favourite parts, as it winds down through a pretty wood. Approaching the turn off into the church yard, I saw a fellow runner on the floor, having tripped up. He was okay but I overtook him descending, only to have him go past while I was getting some coke at the Checkpoint of Banging Choons. I was to keep him in sight all the way to the end. The last climb to the trig point was memorable for me, as I was reminded of an even more mental event going on while I was running. There was a sheep leg to the side of the path, the top half bare bone and the bottom with black wool and a hoof. Part of me wanted to sling it over my shoulder as a funny souvenir – I bet no-one’s done a lap of the track with a dead sheep leg before! – but I realised that I didn’t really want to have to carry anything for the last couple of miles. The descent off the trig point is probably the most technical part of the whole race. A narrow footpath that goes straight down, it is rutted and chalky, so it takes a bit of concentration. I amused some local scalliwags with my breathing technique of whooshing the air out on each exhalation, but it worked! When I finally hit the road into Eastbourne, I saw the guy that had fallen again. He was fast walking but when he glanced behind him, he started running. I felt like the Terminator as I ran along, slowly gaining on him as he had to keep walking. Hitting the seemingly endless bike path that takes you round to the track, I finally passed him and tried to encourage him to keep running. He said, ‘Go on, 1km to go!’ I never believe people when they tell me distances anymore but I think he was about right. I was in a lot of pain now and it was hard to breathe, so I started talking myself in, telling myself I was nearly there and to come on. I came onto the track where there was a lot of people cheering runners through. I heard Jayson and Scott and started on what I thought was a 200m final surge. Turns out it was 400m, which just seemed a bit too far! I glanced at my watch to see if I could get sub 8.15, but I only had 8 seconds so knew I wouldn’t make it. I aimed instead not go over 8.15. In what I imagine was a nail biting sprint finish, the walk/run guy caught me right in final straight and beat me by 4 seconds. Maybe he had the right idea! I crossed the timing mats, found somewhere to sit down and hyperventilated. I couldn’t get any breath in and the poor lady that brought me my medal had to ask if I was okay, but luckily Jayson was there and knew it was just massive exertion. When James came over, I nearly cried and apologised to him for not giving him the race he had anticipated. He knows – probably better than most – that sometimes, you just don’t have a good day and told me it was ‘character building’. It was only a matter of minutes and Gav and Charley both came in, Gav giving an amazing victory roar. I’ve, once again, come away from a race with some new friends, probably because it didn’t go well. If I had been able to be in race mode, chances are I would never had met some lovely people. So what have I learned from this? I know now that I can slog it out for a long time and chug away when the end is in sight. This has happened to me before on a much more unpleasant scale and I think after this race I am less likely to give up because I aren’t going to get the result I want. Food and drink was perfect so I am more convinced than ever that I have this nailed for now. Precision Hydration tablets are an absolute gem of a product and I think they help with food going down more easily as well as hydration. I will be looking at the lead up to the race, as I know things weren’t perfect and that some areas need to change going forward. Working with Eddie Sutton since September has helped me start to understand these issues a bit more so thanks to her for working around a less than ideal situation. But I do know that work/life balance has a much bigger impact on my energy than I sometimes realise and hopefully this will work itself out soon too. You’ve got to know when to hold em, know when to fold em, know when to walk away, know when to run. You never count your money when you’re sitting at the table. There’ll be time enough for counting, when the dealing’s done. It might not be the coolest song ever, but what a metaphor for running. Racing is all about gambling. You can never know what hand the other players have been dealt so all you can do is work with what you have in front of you. Having the discipline, patience and confidence to know what to do and when is what racing is all about, and when it’s over, whatever the outcome, you might not have the winnings but in many ways, you’ll be better for it.